I had a few problems with the production today. Both of these problems involved changed being made without me being informed as well as people not stepping up to put their foot down on throwaway comments. The son rigg was completely re-modeled not retopologised. I feel this was a decision based on making a showreel at the end of the year and not what was best for the project. The problem with the new model is that is looks nothing like my one. I was then informed there were new character sheets but after seeing them these slightly new designs did not look anything like the model Dave had made from them. It then came to my attention that the reason for all this change was a throwaway comment Dave made about my model looking to old then before we know it the team has Luke making tweaks to the character sheets in order to make the character look younger. The model Dave made did you look younger, yes, it also looked like a cold, hard CGI character. I could not quite explain why but his features seemed to rear towards realism rather than the exaggerated charichature we needed. My character model may have take to long but it sure as hell looked like the character sheet that everyone agreed on. Poison. That is all I have to say on it. The second issue was the Fisherman character rigg. When I asked what could be done to smooth its movement though the pipeline from Maya to Motion Builder (to attach motion capture data) and back to Maya to be animated over. I was met with "the rigg was not built for motion capture. The rigg was built for character animation." Apparently there was some kind of miscommunication regarding the use of character animation and motion capture. I am very sure I made it clear motion capture would be used during previz for this project that would evolved into finished shots. 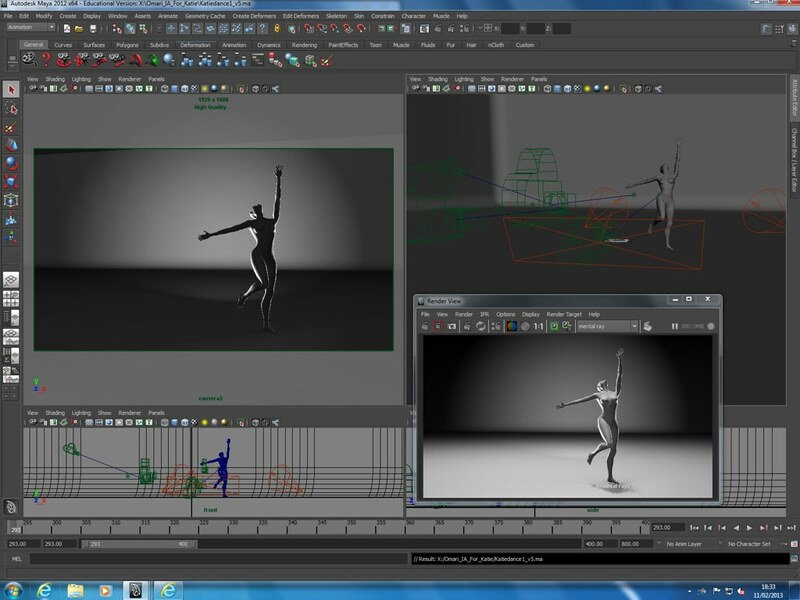 I have 2nd year Digital Animation student Connor McKee on particles in Maya. 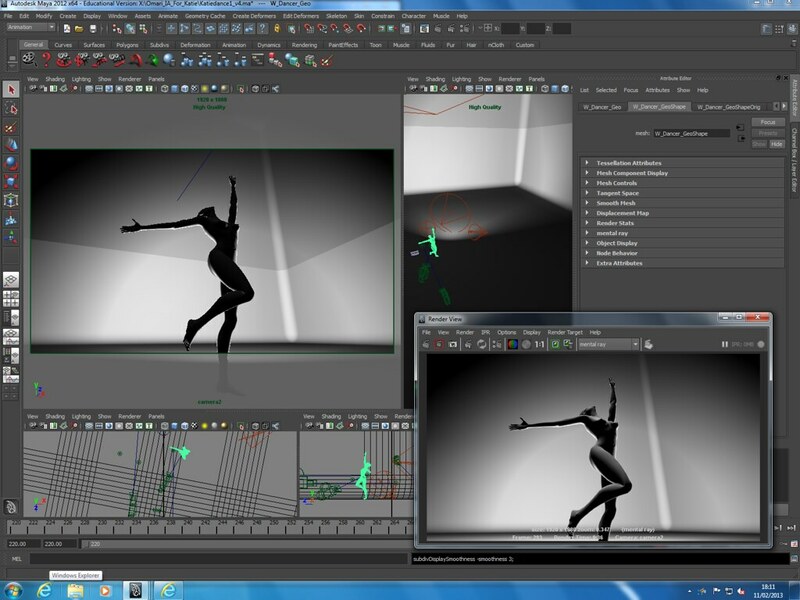 Have been having some issues getting the ink to look right in Maya using a plugin for particle effects called SoUP. Its super powerful but render times of insane and its fiddly. I remember talking to Will Oswald when he came to give us a lecture and he mentioned using After Effects to the the particle wok instead. I had considered this earlier but had not pushed it forward until now. Tomorrow I will have Sean Bone and Alex Beadle testing the workflow for moving a mesh from Maya to After Effects as well as ink and dusts particle effects using the plugin. Out Choreographer Katie Dale Everett requested the previz of Inifinitus Artificium (IA) to play for her show in two weeks. 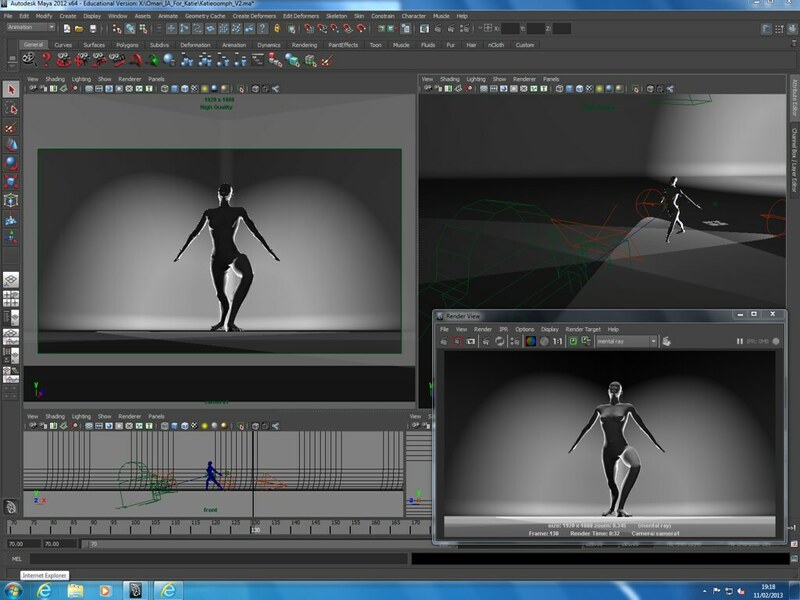 I want to give her renders instead of an ugly play-blasts so I spent a few hours today lighting some the shots. It also allows me to practice my lighting which will come in handy on Hook, Line & Stinker when we start lighting later this week.